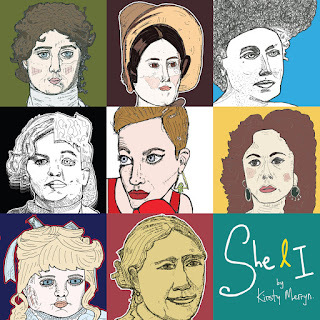 The new album from Kirsty Merryn may only be eight tracks and twenty-eight minutes long, but it is a gorgeous blueprint on how to deliver a record succinctly packed to the rafters with treasurable discoveries. This may well be classed by the authoritative sources as one of the leading UK folk albums of the year when the dust settles, and few disputes are offered here. Apart from Kirsty’s pristine vocal prowess, the amazing notion from listening to the album cold is that this is not a dip into the world of the traditional song. 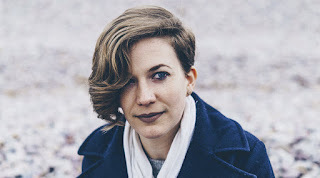 Such is the magnitude of Kirsty’s compositions, folklorists in centuries to come may well class these songs as important as those passed on by word of mouth. The big clue is in the title, and gender focus is at the core of SHE & I. The eight tracks are dominated by a female character at the centre of the story. These possess a fluctuating level of historical importance, ranging from the well-told story of Grace Darling in ‘Forfarshire’ to the unknown woman featured in ‘The Birds are Drunk’. Kirsty’s horizons also wander from the deeply personal in ‘The Pit and the Pugilist’, with a focus closer to home, to a leap across the ocean to tell the story of Annie Edison Tyler in ‘Queen of the Mist’. Familiar name? if not, buying this album and adopting some investigative skills will broaden your horizon. Kirsty is joined by two vocal collaborators in Steve Knightley and Luke Jackson on a couple of the tracks. However, the biggest compliment to pay is her voice blossoms best when in solo mode where its unblemished attributes can totally own a song. Knightley's impact does not end with his vocal part as he has been Kirsty’s biggest advocate, including inviting her to open for Show of Hands on a run of UK cathedral dates. Ultimately, Kirsty’s music, whether in her instrumental, vocal or writing skills, will stand alone on their merits and every indication is that this will be at a high elevation. Picking out a standout track is a tricky choice, but the piano led piece ‘An Evening At Home in Spiritual Séance’, not surprisingly featuring Kirsty in solo mode, would comfortably fit on any shortlist. If pushed to pick one though, ‘The Pit and the Pugilist’ is a strong album defining number and highly influential in the opening track position. Regardless of how the narrative plays out, Kirsty Merryn has staked a claim to be a rich exhibitor in contemporary folk music. Elegance and a natural beauty to her music frame an album weighing strong in traditional charm. SHE & I is an impressive catalyst for projecting the talents of an artist destined to court and attract widespread appeal.